50. The Beckham Experiment | Burtogram. I still remember it as if it were yesterday. It was 2007 and I was in the midst of replying to an email at work when I got a breaking news email. It said, “David Beckham signs with Los Angeles Galaxy.” I immediately logged onto ESPN.com where they confirmed that the English soccer star had signed a five-year, $250 million deal to play in the MLS. I was shocked. Not only was the MLS considered a third or fourth-level tier league in the eyes of most soccer fans worldwide, the salary seemed outrageous considering the salary cap for each team in the league was only $2 million. (MLS has enacted a “designated player” rule that allowed MLS teams to sign an international player for a higher salary that did not count against the salary cap, but still, $50 million a year?) But there was Beckham a few days later, holding up his new LA Galaxy jersey at a press conference in Los Angeles and telling reporters that he was there to increase the awareness of and rise the league to a higher level. I have always been a huge soccer fan; despite that, it was tough to watch MLS games in 2007. The few games I watched on ESPN were far removed from the Premier League matches that aired in America. It seemed like players kept kicking the ball from one side of the pitch to another without any direction to the pass. Soccer has a reputation for being boring among Americans who are used to faster-paced sports, but unfortunately, the product on the field in MLS stadiums was not helping allies of soccer argue against that perception. Could one man use his fame and talent to take an entire league on the back of his shoulders and elevate it to a place where it could be more respected worldwide? Grant Wahl decided to answer this question in his book The Beckham Experiment. Wahl’s book chronicles the day-to-day experiences of the first three seasons that David Beckham suited up for the Galaxy from the perspective of Beckham; other players (particularly Landon Donovan); Alexi Lalas, the GM at the time Beckham was signed; Tim Lewicke, the point man representing the Galaxy’s ownership group, Anschutz Entertainment Group; and Simon Fuller, Beckham’s manager/agent and CEO of 19 Entertainment. The result is a book with a remarkable insight into the world of sports and entertainment. Beckham signing with LA was so much more than an athlete signing a contract; it also involved a strategic partnership with AEG (the second largest concert promotion firm in the world and owner of multiple arenas) and 19 Entertainment (who represents several musical artists, including the Spice Girls). It also detailed how much power a celebrity and his/her handlers potentially have if given the ability to do so and the friction it can cause. In addition, the book introduced an interesting concept on sport versus celebrity. For an athletes like Beckham to be truly successful, a balance is required between what they do on the field and off. If one side starts outpacing the other, however, trouble will ensue and does in the book. I thought the book was incredible. I am a big fan of Wahl’s from his articles in Sports Illustrated and when I heard of this book, desired to read it at some point. He gives a fair assessment of the situation from both Beckham’s and the Galaxy’s side of the story. My only wish is that he would scribe a new edition of the book that covered the last three Beckham seasons in LA (after an injury-riddled 2010, Beckham would help lead the Galaxy to consecutive championships in 2011 and 2012 before retiring). I would also like to see Wahl’s assessment on Beckham’s overall impact on the MLS during his tenure. The league has taken huge strides in improving its on-field product as quality of play has improved, most teams play in soccer-specific stadiums, and attendance and TV ratings have increased from 2007 to now. How much of that, though, can be attributed to David Beckham? 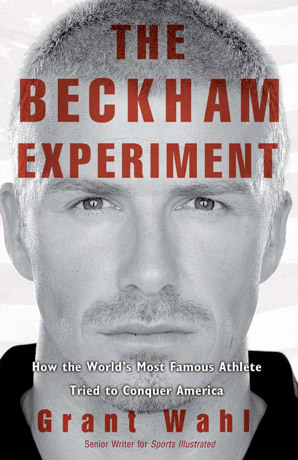 If you are a fan of Beckham, of soccer, or want to know more about the inner workings of the sports world, I recommend this book be added to your reading queue.